YouTube Watch History – You can easily find the videos you’ve watched in YouTube through YouTube watch history. But to find those recently watched videos in YouTube watch history, you need to have signed in to YouTube. Even if you are not signed in to YouTube, YouTube improves your videos recommendation on the basis of the videos you’ve watched from the device you are using. The good thing is you can’t view YouTube watch history if you’ve signed out, however, you can delete the signed-out watch history from your device, if you don’t want such videos recommendation. Here, we will guide you to view or delete videos from your watch history on YouTube when you’re signed into YouTube and delete watch history when signed out. Go to youtube.com in your web browser. Click on Menu besides YouTube icon at the top right corner of the YouTube page. Select “History” from the menu. 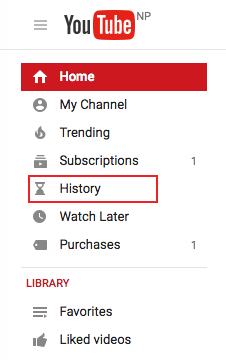 Click on the hour glass “History” icon at the bottom of any YouTube page. After you’ve viewed the watch history following the steps mentioned above, go through the instructions below. To remove a specific video from the watch history in YouTube, click the “Delete” icon at the right side on any video you’d like to delete from the watch history. And If you want to delete your entire watch history in YouTube, click “Clear all watch history” on the top of the page. You can also click on “Pause watch history” if you don’t want the videos you are currently watching to be displayed in your YouTube watch history. Launch YouTube app in your device. Tap the History option from the Menu icon besides YouTube icon to view your watch history. To remove a specific video, tap the menu icon next to the video you’d want to delete. Then, choose “Remove from Watch History” to delete that particular video. 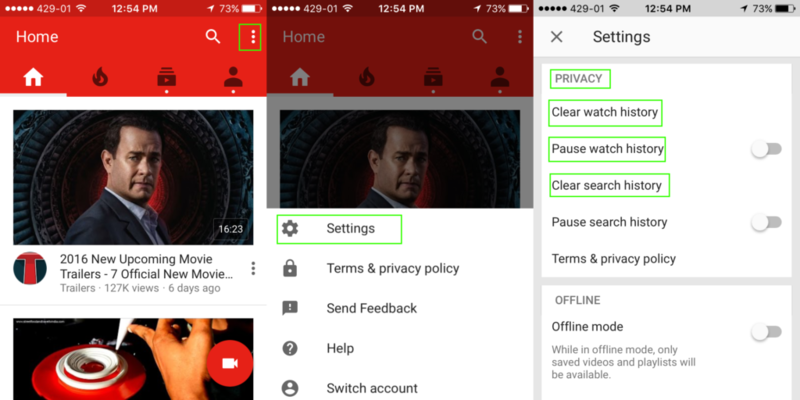 However, if you want to clear all your all YouTube watch history, simply tap “Menu> Clear History”. Click on the hour glass “History” button at the bottom of any YouTube page.